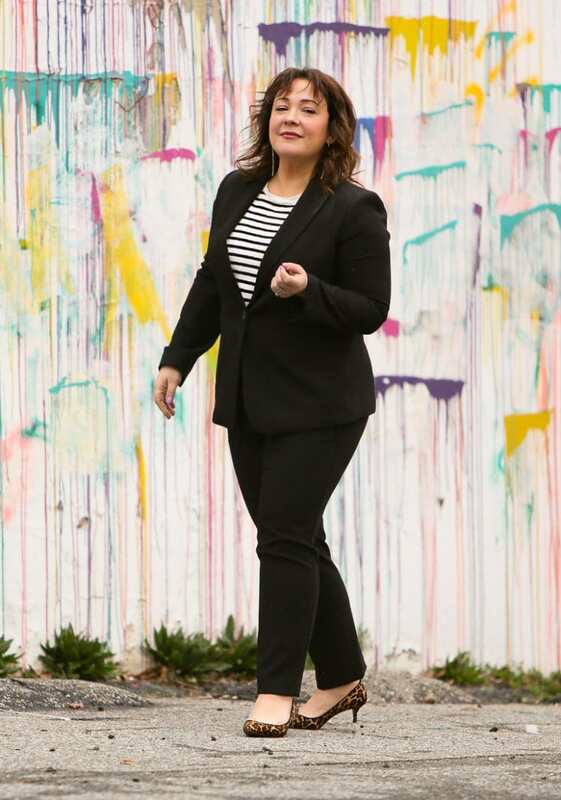 Ann Taylor reached out asking if I'd like to try their new suiting collection and I jumped at the chance. Long-time readers of Wardrobe Oxygen know I used to be a major Ann Taylor fan and regularly recommended their suiting. In recent years I haven't found the suiting as high of quality… no more. 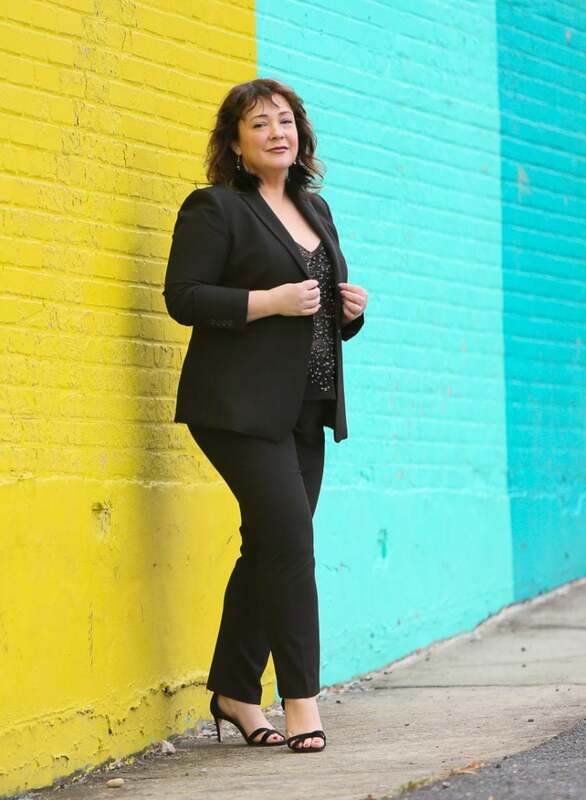 Their bi-stretch suiting collection is the quality, fabric, and fit I've been looking for. 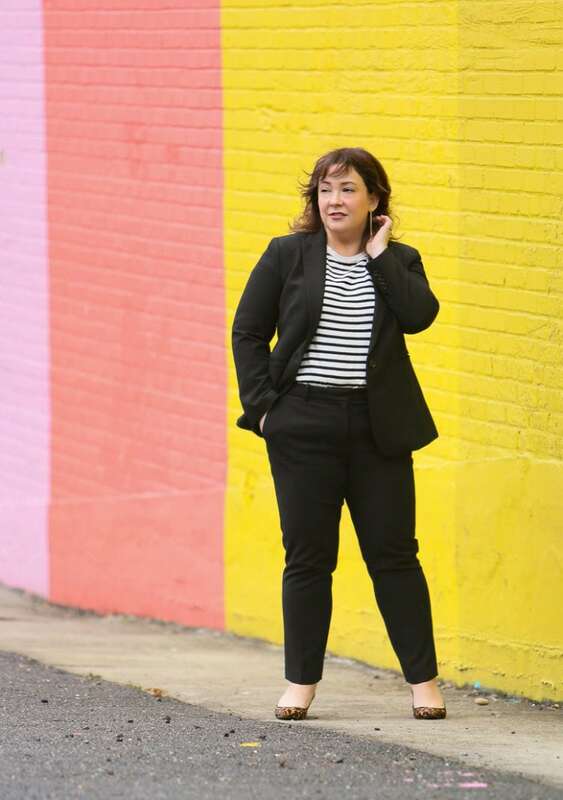 Ann Taylor's suiting goes up to a size 18 and has petite and tall options. All this and… it's machine washable! Really! 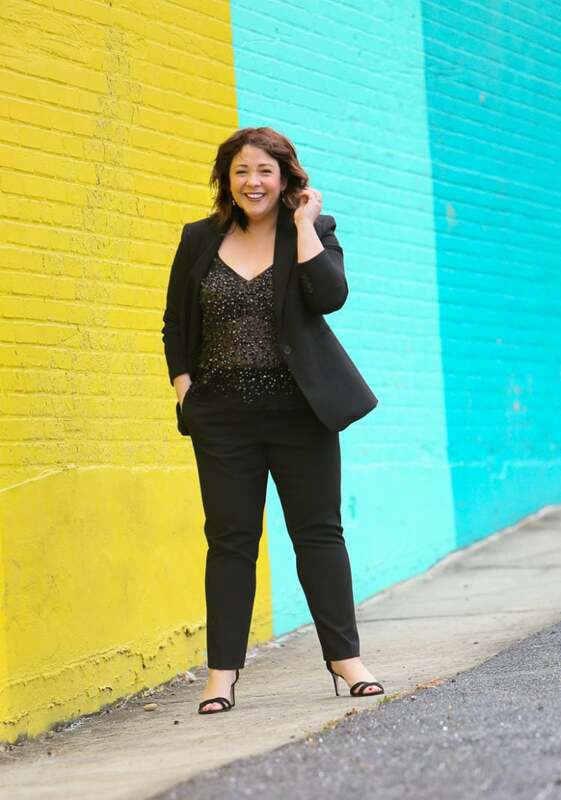 I decided to try out their Long 1-Button Blazer and Ankle Pant in their Bi-stretch fabric and found it versatile enough to go from desk to drinks, work to weekend with ease. The suiting is a non-shiny subtly ribbed fabric that looks at home in a boardroom, but is classic enough to glam up for a cocktail party or evening affair. I love that this collection has a variety of pant cuts, blazers, skirts, and even tops in the same fabric and color. You saw this same blazer Friday on the blog. Since receiving this suit I've worn both pieces separately, enjoying the versatile fabric and straight from the box fit. Since the suiting doesn't have any identifying details or even a flashy button, they are pieces that can be worn again and again without being obvious. Friday I dressed the blazer down with a tank and jeans. Here I make the suit perfect for the office. I love mixing patterns, especially stripes with leopard. A short-sleeved lightweight sweater is a nice alternative to a blouse and provides a nice look when you remove the blazer. Consider dressing up the look with a small square scarf tied at the throat. Kitten heel pumps are dressy while still being walkable; a leopard printed shoe is more versatile than you would think, working with black, brown, and most any color under the rainbow. This look would look great with a flat shoe like a pointed-toe pump, an oxford, or a loafer. I've always been pleased with the quality of Ann Taylor shoes. These are a couple years old but these at Ann Taylor are the same name, shape, and fabric and receive rave reviews from customers. My friend Tanvi also received a suit from Ann Taylor; she chose the same suit but in grey. 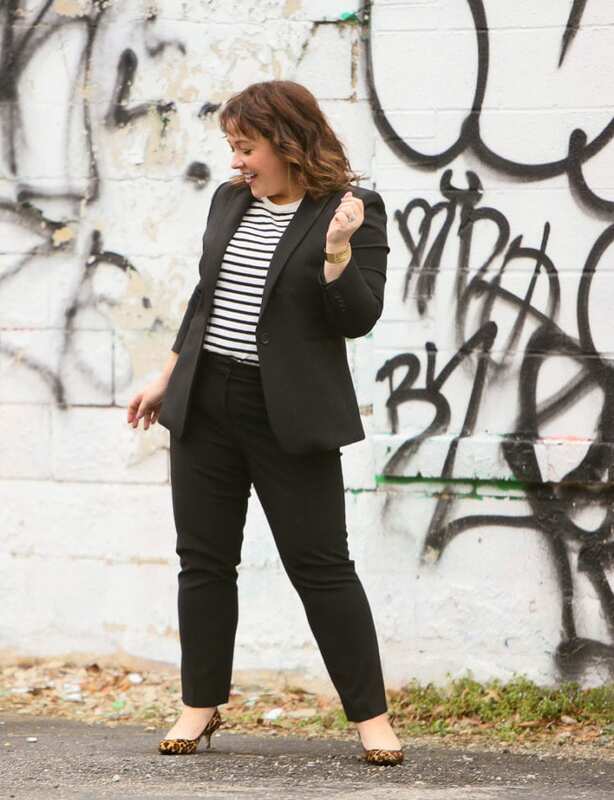 Hop over to her blog to see this suit on a different frame in the other color option and read her tips on power dressing. A classic black suit is easy to dress up for a cocktail party, the theater, even a wedding. A switch of blouse, shoes, and accessories and you're glammed out ready to party! I love ASOS for dressy shells and tops and that's where I got this double-layer cami with adjustable straps. ASOS can be hit or miss with fit and quality, but they have free shipping and returns so it's easy to try and not have buyer's remorse. I also like that ASOS has a broad size range and carries a variety of brands and pricepoints. I bought these earrings at Etsy over a year ago. I didn't consider that my hair is dark and the black feathers get a bit lost, but the subtleness is sometimes good. Having a dressy yet not flashy earring lets the beaded camisole stand out and the whole look is more refined than it would be with more sparkle at the ears. Adding a bit of gloss over the lipstick makes the same makeup look feel more festive and evening appropriate. I do plan on taking the pants to the tailor and have them shortened just a hair so they are actually ankle pants. This will make them look less corporate and work with a broader range of shoes. But I really like the fabric and fit of this suiting. I haven't tried washing the suit yet. I'm pretty surprised it's washable because it's far more structured than other washable suiting I've tried, and it's fully lined. I'll report back if I'm brave enough to try washing it and how it turns out. 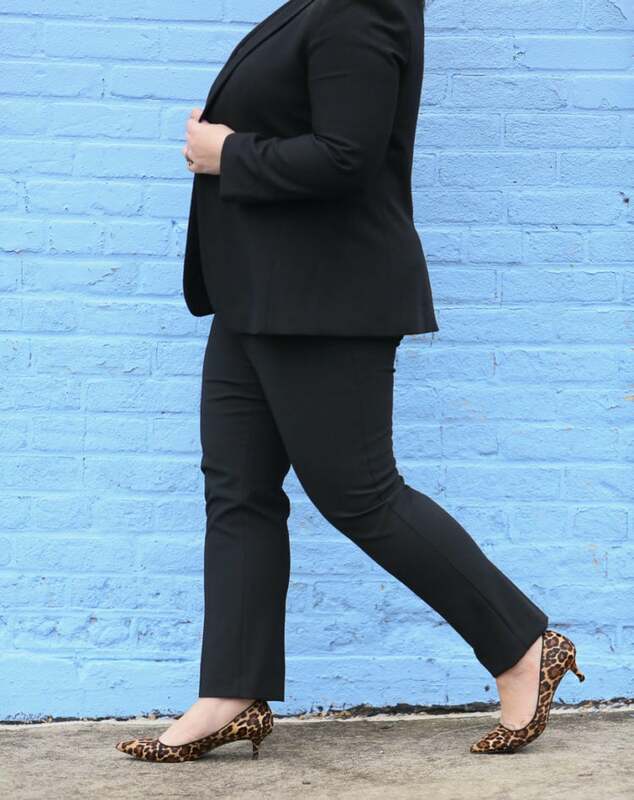 I was provided the suiting to feature on Instagram in a single post, but chose to share the suit here on the blog because I really think it's super nice and has made me an Ann Taylor fan once again. Question about the pants – I have a few old pairs from AT that have a permanent front crease, which I love. Do these pants have a crease that lasts through washing, or did you need to actually iron them to get the crease? Thanks! They do not have a permanent crease, they will need to be ironed to maintain one. Glad to know the quality is back. Nothing like a suit to make us all feel chic easily. I swear I’m more productive in a jacket! I am VERY excited that it’s fully lined and machine washable! Okay reading the comments makes me wonder if I am weird for not having suit issues other than I look really old in them? You’re right — this looks like a totally different suit in the glam photos. Amazing! This might sound silly but when you wear a cami like this with spaghetti straps do you wear a regular bra and don’t remove your blazer or do you do strapless? LOL I will wash it but not likely this month… I have some events coming up where the suit may be the perfect choice. But once I wash it I will report back! I love how you styled it – both ways! Soooo chic. I have yet to wear a suit with a cami. I too am worried about sweating and getting it discolored like Dianne. But you have inspired me to give it a shot. Awesome! And thank you Tanvi! Love this suit on you! And Tanvii, too—her blog looks great and I’ve bookmarked it. Oh I’m glad you like her! She’s a wonderful person and I am so glad I’ve gotten to know her IRL! These pants are so flattering on you! Right? They’re comfortable too, and the pockets don’t bow out. Big fan! How do you protect the armpit area of the suit jacket????? When I wear a cami under a suit jacket I end up sweating up the armpit area of the suit jacket- which is gross! So, I stopped wearing the combination. I love your blog. I especially love seeing pictures of happy you in bright colors. It gives me the courge to wear happy colors too.